One thing we try to do at the cabin is use and reuse items to their fullest potential. Here's a recent example of making something from nothing. On a recent boat trip, our good friend John found an old black rubber float washed up on the beach. Upon inspection, the crustacean and algae encrusted discard was still watertight and able to float. John brought it home to us and Wayne transformed it into what we call "The Big Bobber." A little elbow grease and paint, and now it looks like a huge red and white fishing bobber. We've given it a place of importance at the end of our entrance boom. Now passing boaters can see our breakwater logs (for safety reasons) and we can easily find our front "gate." My cucumber plant has been struggling, but I found two yellowing ones hiding underneath the leaves and one nice new one near the top. The yellow ones weren't good for eating raw, so I decided to make all of them into pickle relish. 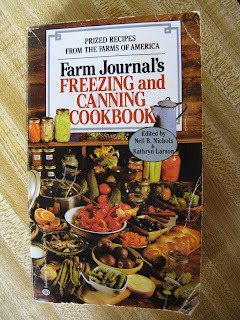 I couldn't find a recipe that small, so I took one from my Farm Journal's Freezing and Canning Cookbook and adjusted it down. You can use a food grinder or processor set on course. Up at the cabin I chose to use the old fashioned manual method, a sharp knife. Make a brine and soak vegetables. Finely dice the cucumbers, onion and peppers. I used my homegrown dried onions (the small ones get used first) and a mix of banana peppers and one Anaheim chili. Strain and rinse away excess salt. Dissolve the pickling salt in two cups of water. Do not use table salt because it has additives and iodine that can turn pickles dark and unappetizing. Cover the vegetables in the brine and let them rest in the refrigerator for a minimum of three hours. Strain the vegetables and rinse them well to remove excess salt. Use nonreactive utensils, bowls, strainers and pans to prevent the acidic ingredients from taking on a metallic taste. Mix the vinegar, sugar and spices. Mix the vinegar, sugar and spices in a non-reactive sauce pan. I used the enamel lined pot that I found at the thrift store for $2 several years ago. Add the vegetables and simmer over medium heat until they are tender and the liquid has reduced to a thick sauce. It was a really hot day so I used our outdoor BBQ for the cooking portion of this recipe. And the view wasn't half bad standing there to stir the mixture to keep it from sticking to the bottom. One half pint in my small canner. If you eat a lot of pickle relish, you can let the mixture cool and store it in the refrigerator. If you want to preserve your pickle relish for longer storage, use the water bath method (click here for step-by-step directions) and process for 10 minutes (adjust as necessary for your elevation). Since I do small batch canning, I invested in a Norpro Asparagus Stainless Steel Cooker/Steamer. It doubles as a small canner that can hold one half pint or one pint with the required one inch of water over the lid. I cook with propane (even in the kitchen), so I don't have to heat or maintain a large volume of water at a rolling boil for small batches. And there you have it. A small batch of great tasting pickle relish. This recipe will give you two half pints, or one pint. I processed one for saving and put the second in the fridge for immediate use. My dad would have been proud of me. He was the pickle and relish maker in our city-folk family. The funny thing is that I don't remember watching him do it. Gooseberries can be distinguished from Currants because they have prickles and spines on their stems. Otherwise, they are members of the same family. The Swamp Gooseberry is very common along streams, lakes, swamps, and moist forest slopes. We found this example next to Bob’s Lake on Texada Island growing in the shade of a fir tree. Swamp Gooseberries grow at low elevations from northern California to southern Vancouver Island. The plants are from three to five feet tall and have reddish flowers in June. The glossy green leaves are small and maple-shaped with five indented lobes. Dark red or purple berries form in late summer. The berries are edible but don’t have the most pleasant flavour raw, but it is said that their juice can be made into wine. References: Wild Berries of the Pacific Northwest by J.E. 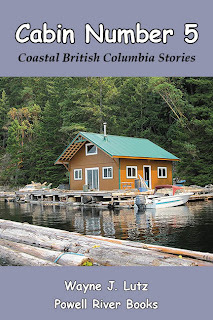 (Ted) Underhill (Hancock House, 1974), and Plants of Coastal British Columbia by Jim Pojar and Andy MacKinnon (Lone Pine, 1994). There's lots of moss, sticks, leaves and other debris lying on the forest floor. That's called duff. I found this slimy visitor taking advantage of this buffet of blow down. Slugs are in phylum mollusca and genus gastropoda. The Black Slug (Arion ater) is from Europe, but was introduced into British Columbia in 1941 and has been considered a serious pest since 1962. They can grow up to 18 cm, pretty big for the slug world. They are characteristically black in colour, have tentacles (eyes and sensory organs) at the front, and tubercles (rough projections) on their back. They have the distinction of being hermaphroditic and can self-fertilize. This makes reproduction quick and easy. They start at about three months and lay about 150 small round eggs at a time. During their 1-2 year lifespan, they can produce a tremendous amount of offspring, and so on, and so on, if you get my drift. That is one of the reasons they are such a tremendous pest. Touch one and they roll up into a ball and sway from side to side. For three days each summer there's an unusual occurrence at sunrise. The sun comes up in the notch near the top of Goat Island. It then sets behind the hill to rise again near the peak. When that happens, sunlight backlights the treetops, giving them a brilliant halo. Heading up Lewis Channel on the way to Quadra Island. 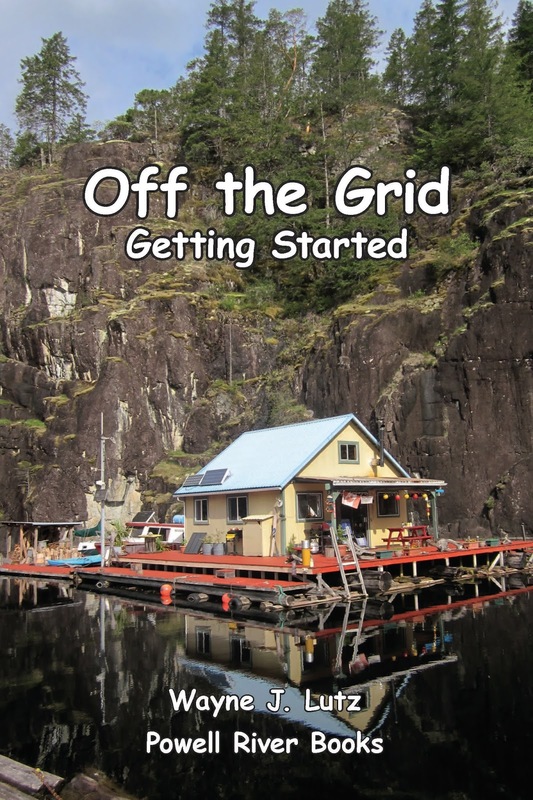 Even people who live off the grid like to have a vacation on the grid. Last weekend we treated ourselves to a short holiday at one of our favourite places, the Heriot Bay Inn and Marina on nearby Quadra Island. Rounding the north side of Cortes Island. We went by boat from Powell River. 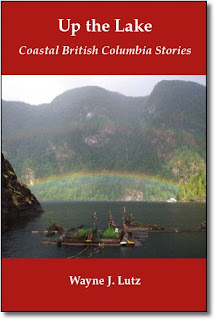 There are several routes, but we chose the scenic one via Desolation Sound and the north side of Cortes Island. BC Ferry leaving for Cortes Island. If you aren't travelling by boat, you can reach Quadra Island by car via BC Ferries from Campbell River on Vancouver Island. Heriot Bay is on the eastern side of Quadra. The original inn was built in about 1895, rebuilt in 1912 and updated since. We chose to stay in the marina with our Bayliner 2452. They have diesel and gas, and offer slips for boats large and small. Our Bayliner (the small one) at the Heriot Bay Marina on the second dock. There's also a dinghy dock for people from the nearby anchorage at Rebecca Spit to tie up. Call ahead for a reservation or check in on Channel 66a to get a spot. Amenities include water, showers, laundry, Internet, and some power hookups. The village grocery store is within walking distance for re-stocking. Getting to the Inn from the Marina. Other accomodations options include rooms in the inn, suites and cabins, or oceanside tent and RV campground spots. 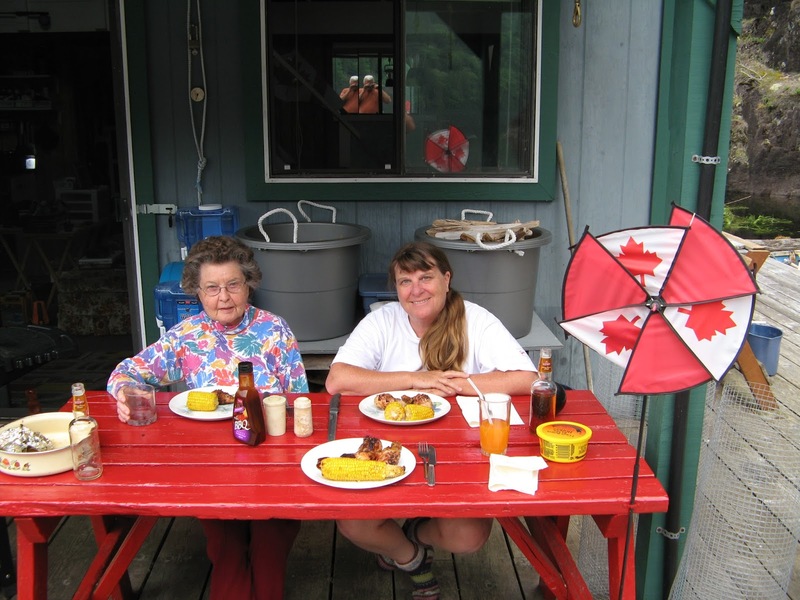 We love to eat breakfast, lunch and dinner at the Inn's Heron restaurant. There is inside seating, but we love the outside deck with marina and ocean views. There's also a pub for music, watching games on TV, or dancing. Dining on the deck at the Heron Restaurant. The Heriot Bay Inn and Marina are open all year long. Travelling in winter or shoulder seasons offer a substantial discount, but with such reasonable prices coming during the summer is your best bet. Step 1: Chop banana peels. Following homesteading blogs gives me some great information. Because my floating garden and deck pots drain into the lake, I’m always interested in finding organic means for pest control and plant nutrition. I learned at about Banana Peel Compost Tea at Survival at Home. We frequently eat bananas for breakfast and I always cut up the peels to go into my compost pile, but thought this new way of using them was worth a try. The article said banana peels are high in three major nutrients: nitrogen, phosphorus, and potassium. Here are the directions to extract these nutrients for garden use. Step 2: Add peels to water and refrigerate. 1. Fill a container about ¾ full of water. 2. Chop banana peels and put in the water. 3. Refrigerate to preserve the liquid. 4. Continue to add chopped peels until full. 5. Strain the liquid into another container. 6. Store in the refrigerator until use. Soaking the banana peels extracts the nutrients and chopping the peels makes this process easier. Once you strain your first batch, start over again. The remaining banana peels can be added to the compost pile. The banana peels will turn black, but refrigeration will keep the compost tea fresh. Step 3: Strain the liquid and store in fridge. 1. To use it as a liquid fertilizer, mix one cup of the compost tea in one gallon of water. Use it to water around the base of plants. 2. To use it as a natural aphid control, mix the compost tea 1:5 with water (one part tea and five parts water) in a spray bottle. Spray plant leaves and stems. Aphids hate bananas, plus the plants will absorb the mixture for extra nutrients. Step 4: Dilute with water before use. Recently, someone asked me to describe my perfect day. Here it is. I wake to twinkling reflections of sunlight on the ceiling of the loft bedroom of our float cabin on Powell Lake in British Columbia. The sun rises over Goat Island and the rays bounce off the water. I brew coffee laced with cream to enjoy on the front deck, watching work boats head up the lake. When summer crowds are gone, and we get to have our little piece of paradise all to ourselves. Even in fall when there’s a chill in the air, golden maple leaves shine with a radiant glow. After breakfast, I work in my floating garden. I grow tomatoes, onions, beets, lettuce, spinach, carrots, kale, chard and herbs. I also grow a wide variety of things in pots on the deck. Just a little weeding and feeding keeps everything in top shape. I pick some fresh veggies to clean and chill for dinner. While I'm gardening, Wayne often uses his chainsaw to cut wood for our winter woodpile. Wood floats right up to our deck begging to be added to our supply. 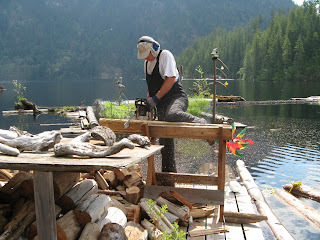 When he's done I use my log splitter to make stove-size pieces, and the fruits of our labor stack up fast. Lunch is a quick snack so I can get ready for work. At least that's what I call it. In the summer I like to read on the deck while soaking up the rays. Living in the north makes taking advantage of the sun important. From October to May there just aren't many days to see, let alone soak up its rays. Just before sunset we get our poles and climb in the tin boat. We troll out into First Narrows and over to the waterfall. If we're lucky we catch a trout. And lucky for him, we catch and release. If we aren't lucky, we still catch a beautiful sunset over the Bunster Hills. Dinnertime is my favourite. Wayne is the cook and BBQ is his specialty. We start with our garden fresh salad then have our meat right from the grill, maybe accompanied by an ear of corn wrapped in foil. After a meal like that I don't mind washing the dishes. While summer is my favorite time of year, I've been known to wish for cool evenings. That's because I love a fire in my wood-burning stove. It is so efficient at heating our cabin that it really needs to be a cool evening, or we have to open the sliding glass doors. If the loft gets hot, it’s hard to sleep. Some people might not think that my perfect day is all that exciting, but sharing it with Wayne in this wonderful place makes it so. 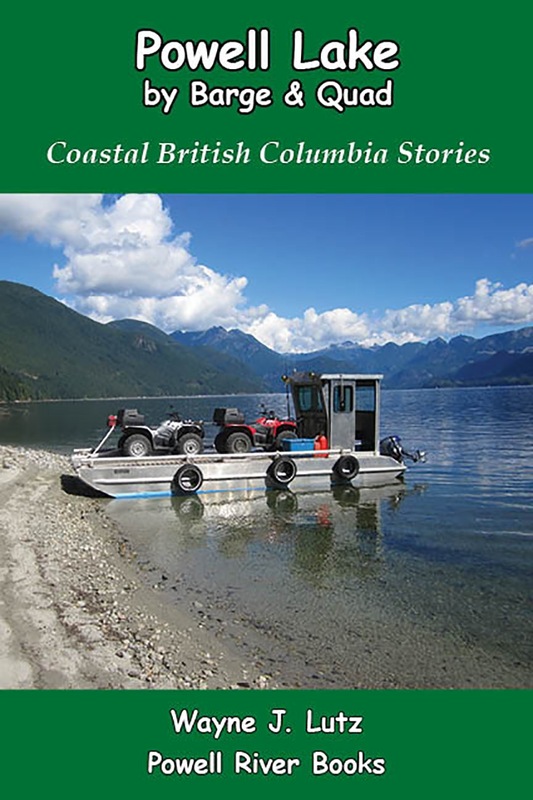 If we need a little more excitement, we take our quads out on the barge to ride logging roads into some of the most beautiful country in the world, or take our sailboat out for a spin around the lake. 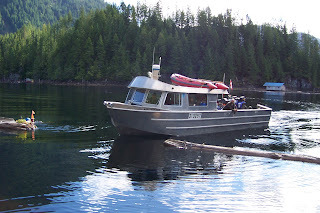 Or we can take our Bayliner out on the chuck (ocean), kayak in protected bays and inlets, or hike the Sunshine Coast Trail. We both worked long and hard at busy city-folk careers. We still work long and hard, but at enjoying our off-the-grid lifestyle. Want to read more? We have lots of critters up at our float cabin on Powell Lake. Most of them are annual returnees, but this year I saw my first Pacific Chorus Frog (Pseudacris regilla). I went to water my zucchini plant and there he was, sunning himself on one of the large leaves. A Pacific Chorus Frog on a matching zucchini leaf. The Pacific Chorus Frog is common in Southern BC west of the Rockies and on Vancouver Island. It can be found in the woods, meadows, and even in urban areas. They come in light grey, tan, bronze or bright emerald green. You can see which kind I found. This colour is great for camouflage on summer plants. They are small frogs, up to 5 centimetres in length. A distinguishing mark is the mask-like stripe that starts at the nostrils and continues all the way to the shoulder. This view shows the sticky toe pads on their feet to assist in climbing. Pacific Chorus Frogs breed mostly in temporary water bodies that dry up later in the summer months. This prevents enemies such as fish and bullfrogs from raiding their eggs and young. Powell Lake has a good sized population of invasive bullfrogs, garter snakes and trout, so breeding here must be a challenge. I had two over-ripe bananas, so I looked through my cookbooks to find a recipe to put them to good use. I found one in a cookbook I got at The Economy Shop, my favourite thrift store in Powell River. Cream together the butter or margarine and sugar. Add the eggs and salt and mix well. Dissolve the baking powder and baking soda in sour cream and add to the creamed mixture. I didn’t have any sour cream, so I substituted plain yogurt. Don’t be surprised, the mixture will foam. Stir in the mashed bananas (2 very ripe bananas makes one cup mashed) and vanilla. Gradually stir in the flour, then mix in the chocolate chips. Don't skimp on them, that's what makes this cake so yummy! Pour into a well greased and floured loaf pan. I used a piece of parchment paper in the bottom to make removal after baking easier. Reference: Wonderful Ways to Prepare Cakes and Cookies by Jo Ann Shirley (Playmore Inc., 1978). 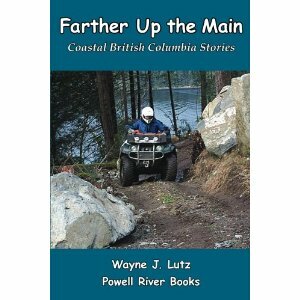 When Wayne and I went quad riding on Texada Island this July, everywhere we looked there were carpets of daisies bobbing their pretty white and yellow heads. Oxeye Daisies growing in profusion in a road cut. The variety was Oxeye Daisies (Chrysanthemum leucanthemum). They are a member of the Chrysanthemum family and were introduced to the area as a weed from Europe. Since they have spread far and wide. The Oxeye Daisy is a perennial plant that regenerates annually from a woody rhizome. They grow profusely in fields, meadows, roadsides, and clearings such as logging cuts at lower elevations. Leaves are found predominately at the base of the plant with a straight stalk supporting each flower head. References: Roadside Wildflowers of the Northwest by J.E. (Ted) Underhill (Hancock House, 1981), and Plants of Coastal British Columbia by Jim Pojar and Andy MacKinnon (Lone Pine, 1994).